Have you found something delicious that you can’t wait to try? Before you get down to it, have a look at the tips below on buying, storing and cooking sweet potatoes. When shopping for sweet potatoes choose nicely shaped, smooth, firm potatoes with even-colored skin. For the sweetest flavor, buy orange or red sweet potatoes. Light-colored potatoes will not be as tasty and will have a mealy texture. Store sweet potatoes in cool (45 to 60F) dry, dark and well-ventilated place for up to two weeks. 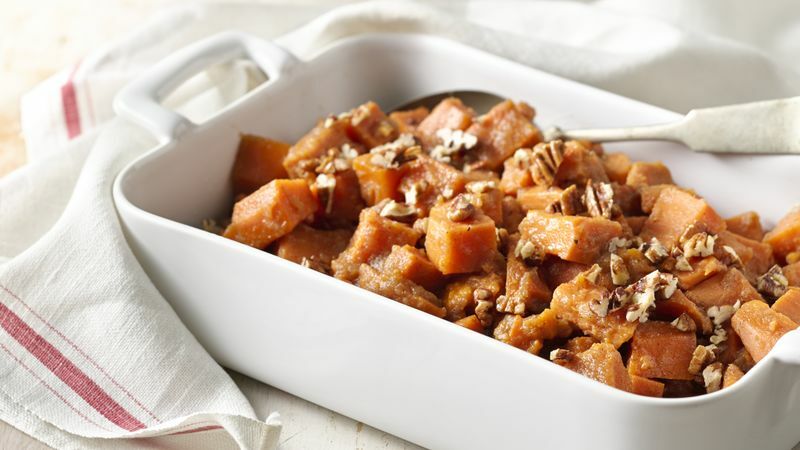 Here are a few basic methods for cooking sweet potatoes. Boil sweet potatoes in water uncovered 10-15 minutes until tender. Steam for 15-20 minutes or until tender. Bake uncovered 1 hour or until tender. Roast 40 to 45 minutes. To microwave, pierce whole potatoes to allow steam to escape. Place on paper towel. Microwave 9-11 minutes or until tender. Cover and let stand 5 minutes. To fry, slice ¼ inch thick, coat with egg and crumb mixture and fry 5 to 8 minutes. For even more detailed information about making the most of these delicious vegetables, check out our article on how to cook sweet potatoes And when you’re ready for more wonderful ways to turn these tubers into everything from breakfast and lunch to dinner and dessert, explore the rest of Betty’s sweet potato recipes.